In the 1953 Ian Fleming novel Casino Royale, James Bond ordered the then unnamed Vesper Martini. He requested a dry martini. “Just a moment. Three measures of Gordon’s, one of vodka, and half a measure of Kina Lillet”. Shake it very well until it’s ice-cold, then, add a large thin slice of lemon peel. Got it?” Well, here we are in 2015 and I think it might be time to give that Vesper an update! 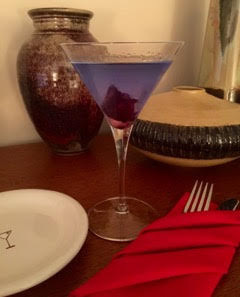 When I received the b’Lure Butterfly Pea Flower Extract from Wild Hibiscus Flower Company, I knew a Blue “Vesper” was in order. Our generous sponsor also sent along Wild Hibiscus Flowers in Syrup. Talk about a gorgeous cocktail! It’s always nice to have a spectacular garnish. Who needs a lemon peel! I prepared and served this delightful cocktail as we waited for our first course.